Gordian Knot: a very difficult or complex problem, solved by thinking creatively. In Part One of Untangling the Gordian Knot - Four Flowers Variant, we presented our interlocking chain of evidence that leads us to believe that Brockwitz was the maker of the Four Flowers Variant (and the related Four Flowers Hybrid and Mystery Grape) as well as the glassware in the Goddess epergnes - Beaded Peacock Tail and Diamond Swirls. Here in Part Two, we play The Devil's Advocate to test our conclusion against a range of questions, counter-arguments and challenges. Having made such a profound and game-changing claim we felt it necessary to play the devil’s advocate and try and knock our theory out of the water. Below is a series of questions we challenged ourselves with, and our responses to those questions. 1. Question: So, why weren’t the Four Flowers Variant or the Beaded Peacock Tail etc., shown in Brockwitz catalogues? Answer: Because they were probably produced earlier than the currently-known catalogues. 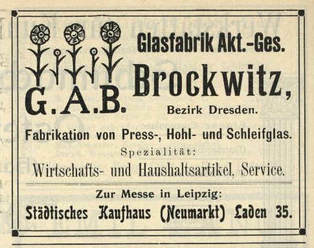 The earliest date on a known catalogue from Brockwitz is 1915. None prior to that have yet been discovered. And it’s possible that the Four Flowers Variant was never shown in any catalogues – it might have been a special order. 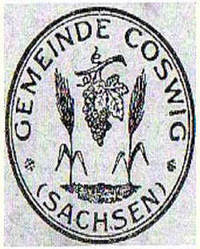 There are, however, some patterns in later Brockwitz catalogues that could have been subsequent, derived versions of the Beaded Peacock Tail and Diamond Swirls, and maybe (just maybe) a Mystery Grape look-alike. 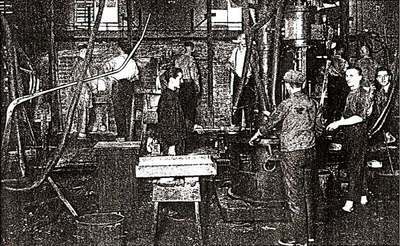 ​(centre and right) in the Brockwitz 1915 catalogue. 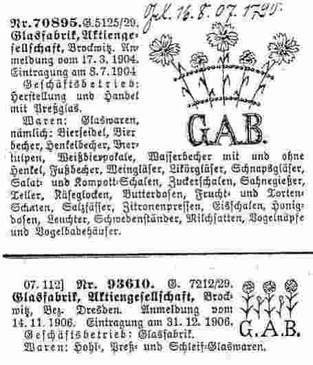 Above, left - this pattern, called Weinlaub (meaning "grape leaves"), was in the 1915 Brockwitz catalogue. It is a very similar design to the Mystery Grape which is shown, centre. 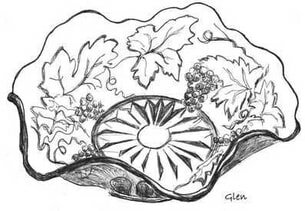 On the right is Glen Thistlewood's drawing of the Mystery Grape showing the star base and a hint of the Thumbprint exterior. 2. Question: The Four Flowers Variant and Mystery Grape are interior patterns, but surely Brockwitz didn’t make interior designs, did they? Answer: Yes they did. One of their early designs is the Headdress pattern, and it is found only on the interior of Brockwitz pieces. 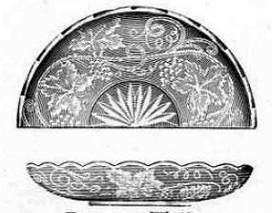 Headdress is found as an interior pattern on bowls with Curved Star, Nutmeg Grater and European Poppy on the outside (all of which are known to be early Brockwitz patterns). Headdress is also found on the interior of Curved Star and Nutmeg Grater sugars (comports). ​It’s very interesting to note that the Headdress pattern has not been found in any of the known Brockwitz catalogues, that date from 1915 onward. So, it is most likely that Headdress was an early pattern, made by Brockwitz in the decade 1904-1914. 3. 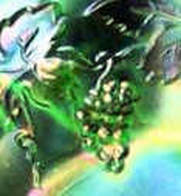 Question: The Four Flowers Variant and Mystery Grape are cameo designs (raised up from the surface of the glass). But Brockwitz only made intaglio (“cut” in) patterns, didn’t they? Answer: No, they didn’t only make intaglio patterns. Many of their patterns are a mixture of both cameo and intaglio, while some (such as Rose Band aka Ariadne) are almost entirely cameo. Brockwitz Christus is an astonishing cameo representation, with some clever intaglio work as well. Brockwitz Patricia is also mainly cameo. 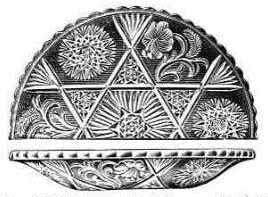 Many other Brockwitz patterns feature a mixture of cameo and intaglio mould-work. 4. 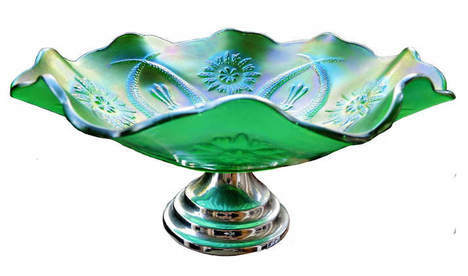 Question: Looking at the Beaded Peacock Tails and Diamond Swirls glass, they sometimes seem to have a frilly crimped edge? Surely Brockwitz didn’t make anything like that? Answer: Yes they did. Some of Brockwitz’ early pieces had crimped and ruffled edges, such as the Sunspray bowl and epergne horn on the right, and the Sungold Floral bowl we showed earlier. 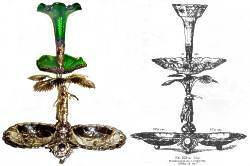 Sungold Floral was also used as part of an epergne - as in the catalogue image on the far right. in the Brockwitz 1915 catalogue. ​5. Question: Are Brockwitz known to have made epergnes? Answer: Yes, lots of them. We have already shown that with the Sungold Floral epergne above. 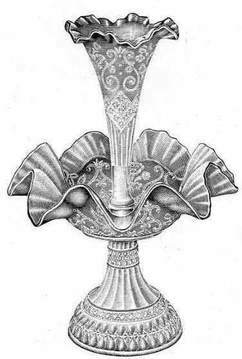 One other that is particularly interesting comprises an epergne horn, a large dish and two smaller dishes, in exactly the same configuration and appearance as the Goddess of Athena epergne. 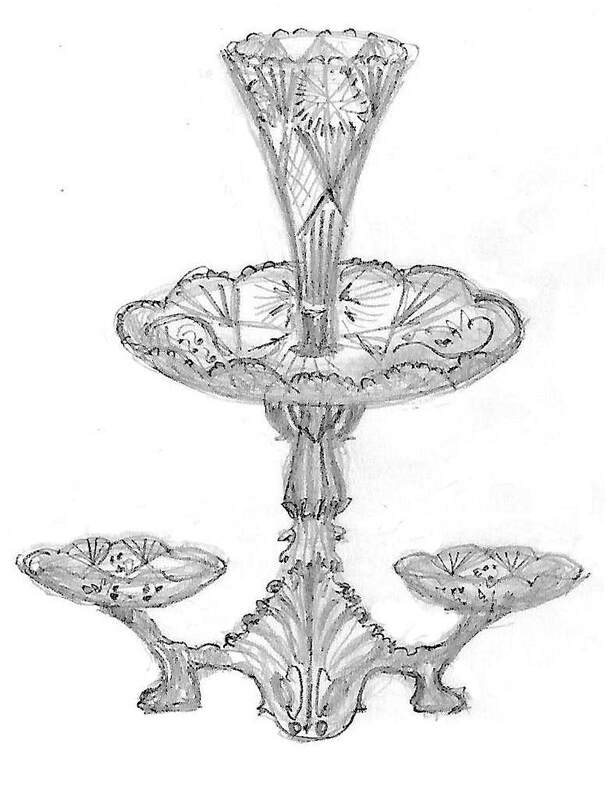 Pencil sketch of the Brockwitz European Poppy epergne, right. Note the horn, large bowl and two small bowls are all clear glass, in the European Poppy design. The central stand and all fittings are metalwork. 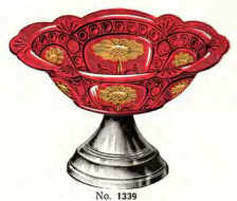 1915 Brockwitz catalogue extract of the European Poppy bowl. 6. Question: What about the metalwork? Did Brockwitz use metalwork with their glass? Answer: Yes, they certainly did, especially on their epergnes (see Sunspray epergne and European Poppy above), which had some very sophisticated metal connectors. 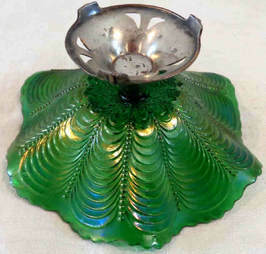 Many flower bowls and other items had metal fitments, and some items were placed on metal feet or holders. 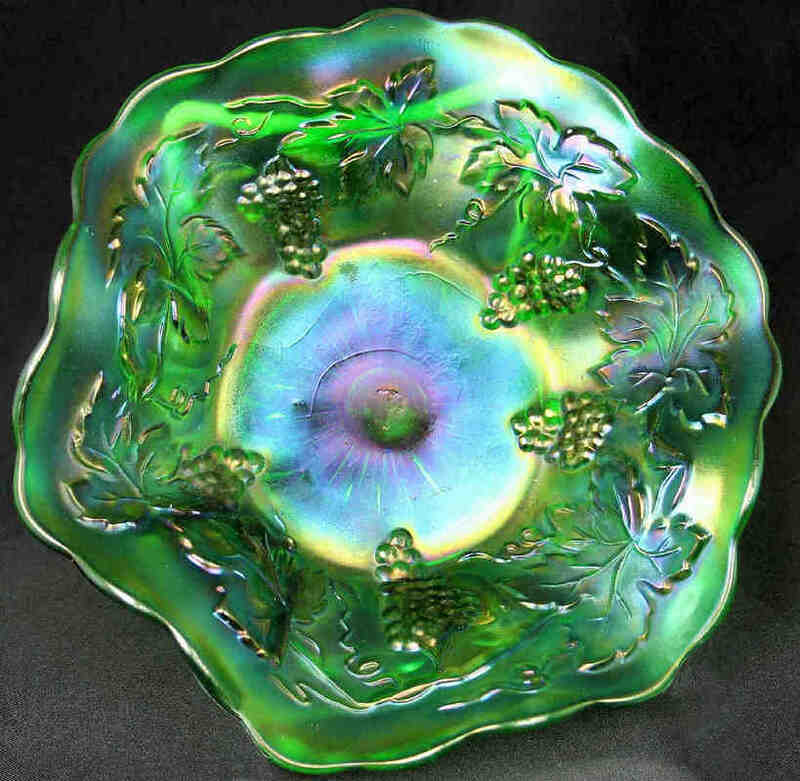 A green Four Flowers Variant bowl on WMF metalwork is shown on the previous page. ​Brockwitz also used Stefan Merkl metalworks to provide stands and holders. ​Right: Brockwitz Asters bowl mounted on a nickel zinc base, from “Metallwarenfabrik Stefan Merkl” catalogue, courtesy Siegmar Geiselberger. 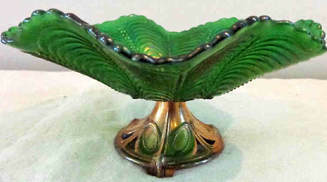 Below, left and centre: a green Beaded Peacock Tail bowl on a single metal mount, courtesy of "dealer-rita". 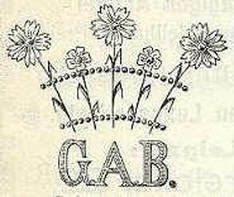 Below, right: a green Four Flowers Variant. The metal base was factory mounted with a screw ​through the centre of the bowl. 7. 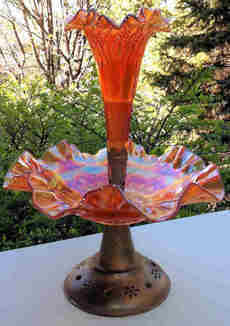 Question: Brockwitz Carnival Glass is said to be only in marigold and blue. But now you’re saying they made purples, all shades of green and amber-yellow. How can that possibly be? Answer: This is a tricky one, but we think we can understand what might have been going on. 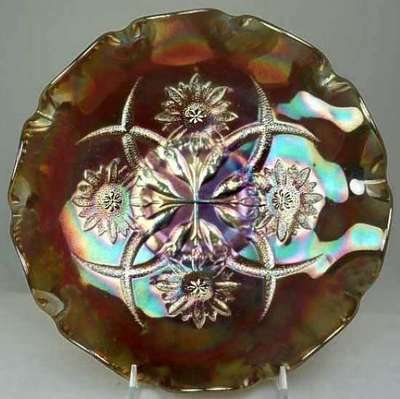 In 1904, when Brockwitz started making glass, the production of iridescent glass in Bohemia (parts of Germany, Czechoslovakia, and Austria) typically included the colours purple, green and amber/gold (in fact they were dominant). So Brockwitz would have been using colours that were popular on iridescent glass at that time. Possibly, after say, c. 1911, when the production (and export) of USA Classic Carnival was at a high-point, Brockwitz changed to marigold and blue as their main iridescent colours, as they had become a worldwide success. Other factors may have been the cause … perhaps the costs were cheaper, or the efficiency was greater. 8. Question: So, isn’t the Four Flowers Variant pattern a plagiarised copy of Dugan’s Four Flowers? Answer: Well, that’s what we used to believe … but the question we need to ask now is, which came first, Dugan’s version or Brockwitz version? Let’s look at the dates we know and see if it helps. Dugan’s Four Flowers appeared in Butler Brothers catalogues in 1911. It can be distinguished from the Four Flowers Variant as it does not have the four long stemmed buds between the crossed pods/leaves. (c) 1914 for the Liemann catalogue showing iridescent glass in a metal female figure. We know that Brockwitz first made glass in 1904, so there would be a window of opportunity from c. 1905 to 1914 in which it would have been possible for the Four Flowers Variant to have been made. Theoretically it could have been produced first, and Dugan subsequently copied the design. The same logic holds for the Beaded Peacock Tail pattern, with even stronger evidence. We see that pattern in the Krug & Mundt’s catalogue in 1906 … it’s entirely possible that Fenton copied the pattern four years later (it is shown in Butler Brothers catalogues in 1910 Fenton assortments for the first time). 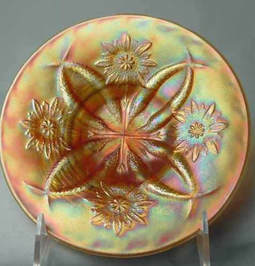 Left: Dugan’s Four Flowers plate in peach opal. 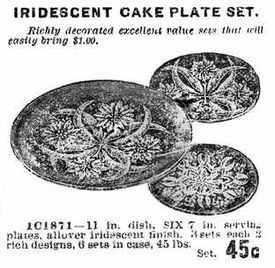 Right: Butler Brother’s 1911 ad for the Dugan Four Flowers cake plate set. 9. Question: Why a floral motif? Isn’t all Brockwitz Carnival in geometric designs? Answer: The early patterns from Brockwitz had a different style and feel than later patterns, being softer and more realistic, even featuring peacocks, grapes, butterflies, flowers and more. But there’s something intriguingly familiar about the flower motif in the Four Flowers Variant design. 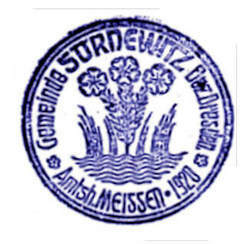 Just look at the Brockwitz trademark logos shown here. They were used on all the company’s promotional literature and ads in its early years from 1904 through to the 1920s when it was changed to a crossed sword motif. The images above date from 1904 and 1906. ​There’s no mistaking the fact that the flower stem on the Four Flowers Variant bears a resemblance to the Brockwitz logo. 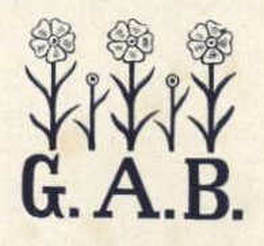 Could it be that Brockwitz made the Four Flowers Variant pattern in the style of their trademark logo? There’s no proof, of course, but we had to admit that when we saw this, it stopped us in our tracks! 10. Question: What about the different sizes? Two sizes of Four Flowers Variant, and then two smaller sizes of the Four Flowers Hybrid. And the Mystery Grape is around 6 inches across. Answer: This range of sizes ties in perfectly with the idea of using the bowls as centrepieces or epergnes. A large master bowl with smaller ones lower down. Note this is how the European Poppy epergne (shown on the first page) was made up. 11. Question: Why do a large proportion of the Four Flowers Variants turn up in the UK? Answer: Brockwitz described themselves as exporting “to all parts of the world” from their very early days, and acknowledged that they stood at “the leading position within the German pressed glass industry”. A lot of Brockwitz Carnival has been sourced in the UK, including some of the rarest pieces known. It seems counter-intuitive, yet it’s a fact, that not much Brockwitz Carnival appears to be found in Germany. Like any successful company they chased sales, and clearly export was a major part of their success. A further factor should be considered. It is likely that early production from Brockwitz, from c. 1904 was exported to Britain, but trade relations were curtailed during the Great War (1914-1918 and for some years following). If Brockwitz was the maker, this adds to the case for the date of production being in their early years. 12. Question: Why is the Four Flowers Variant not seen in a Brockwitz catalogue? Answer: There were surely catalogues between 1904 and 1914, but none have yet been found. 13. Question: Is there any connection with the Eda (Sweden) and Riihimaki (Finland) production of the Four Flowers pattern and the Four Flowers Variant? Answer: No. The Eda and Riihimaki versions of the pattern are identical to the Dugan version of Four Flowers (there are no intervening long stem buds). Both Dugan and Eda/Riihimaki versions were made from two-part moulds and have mould seams. They either used the Dugan moulds or they copied them exactly. The probable date for production of the Eda and Riihimaki patterns runs from c. mid 1920s. 14. Question: If the Four Flowers Variant was made by Brockwitz, why isn’t it in their 1915 catalogue? Why did they stop making it, and why did they change from iridescent purples and greens to blue and marigold? Answer: It’s highly likely that World War One (1914-1918) had an effect on both production and marketing at Brockwitz. Industry was severely affected by not only the war itself, but also by the blockades and conscription. It’s very possible that the coloured, decorative glassware of Brockwitz early years was no longer economical, and that more sustainable colours, shapes and patterns were introduced that were functional, practical and affordable. By playing Devil's Advocate, the questions and challenges revealed additional information that, in reality provides yet further evidence to support our conclusion! We can’t escape the compelling chain of interlocking evidence that leads us to conclude that Brockwitz made the Four Flowers Variant, the Four Flowers Hybrid, the Mystery Grape as well as the glassware for the Goddess and other epergnes, namely the Beaded Peacock Tail and Diamond Swirls patterns, probably for a short time in the early years of the factory, from circa. 1905. Read Part One: Untangling The Gordian Knot - Four Flowers Variant.